Some things just have to work, even if we don’t like to talk about them. Such as for example the area of personal and individual intimate care. With an all-round feeling of being comfortable at those times – and therefore throughout the day, as well – you can face your day-to-day routine more calmly: the results are better performance, better quality of life and more vitality. For 25 years we have been fulfilling the wishes of our customers for a “plus” in their quality of life. Our entire experience throughout this long period of time has been invested in the ongoing development of our VAmat® WC douche. So today we can, in our opinion claim to offer the most durable, energy-efficient (power- and water-saving) solution, with the maximum comfort for the user (douching for any length of time using constantly warm water) at the same time. We also supply one of the widest ranges of toilet-seats: from standard through to the comfort seat, right up to anti-decubitus seats and toilet-seat boosters. 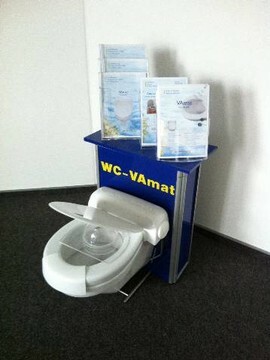 All of our toilet-seats are available both for the VAmat, and separately for virtually all commercially available toilets. Thanks to our numerous affiliates in the medical supplies and rehabilitation field, as well as in the bathroom fittings trade, we are able to offer you a comprehensive on-site service. 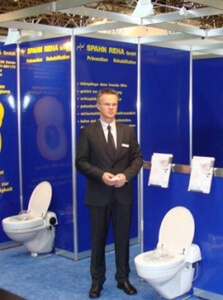 Spahn Reha GmbH provides a nation-wide installation and maintenance service. Wir bieten kostenlose Schulungen für den Fachhandel und eine Ausstellung für den interessierten Privatkunden.